We do like reviewing products like the Samsung 970 Pro. They're so easy to cover everything. To a large degree because looks are unimportant so that removes an awful lot of the subjectivity and lengthy explanatory stuff from our conclusion. It is worth mentioning that the Samsung 970 Pro is a very attractive drive with its black PCB and black heat spreader adorned with the crisp Samsung lettering. Realistically though nobody buys a drive because of how nice it looks. Storage is all about performance and capacity, in that order. The 970 Pro fits neatly into that price/capacity/performance threshold. 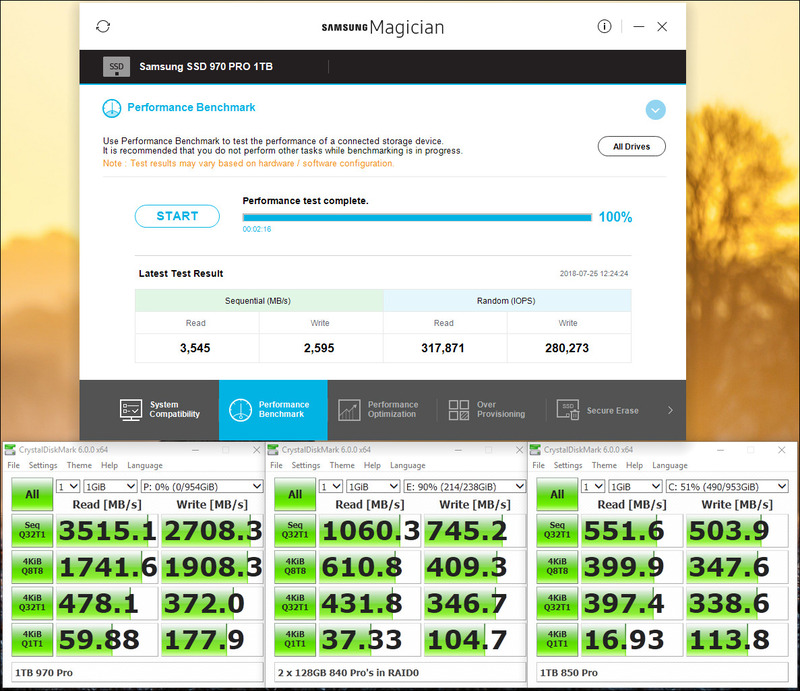 Whilst our initial results with the Anvil benchmark are hardly what one could consider as impressive, every other benchmark we ran gave a level of speed and consistency across all the block sizes that you would hope to find from a Samsung M.2 drive. Rocking in at 1TB it also has more than enough capacity for the OS and apps you might run, whilst having plenty left over for gaming. Given how obscenely large modern games have become, almost the antithesis of the old "squeeze it onto a floppy" method from old coders, then the more capacity the better. Even a modest Steam library will come in around 500 GB and most of the games you'd want to play on the Windows Store are around 90GB. If you've even had half an eye on Forza Horizon 4 then it's best to be prepared, and the 970 Pro will give you smooth, seamless loading which makes the whole experience more immersive and enjoyable. That leaves two main questions. One, is the Pro sufficiently close to the 970 Evo to make it a bargain and two, is it worth grabbing if you've already got a 960 Pro. Dealing with them in order, the 970 Evo has a few tricks up its sleeve with regard to writing that mean it's a fair chunk quicker and more consistent. If your usage is the heavy back and forth of reading and writing then the enhanced speed of the Evo makes it worthy of serious consideration. If, however, you fall into the more populous category of just wanting something which reads games and your OS quickly, and writing is very much a secondary consideration that will only really come into effect when saving games or browsing the internet, then the 970 Pro has more than enough in its arsenal to get the job done smoothly. Upgrading from a 960 is a much thornier issue. Whilst it would behoove you to grab the most up-to-date technology, the speeds we saw in our testing didn't see a significant upgrade from the 960 to the 970. In fact if your budget is extremely tight then the release of the 970 Pro might see 960 Pro prices fall to within your reach, in which case we wouldn't hesitate to grab a 960, knowing that any Samsung M.2 drive will give massive performance. Whilst other manufacturers might have different approaches and under the hood changes, the Samsung range continues to perform at incredible levels, and the 970 Pro is no exception and easily deserving of our OC3D Performance Award. 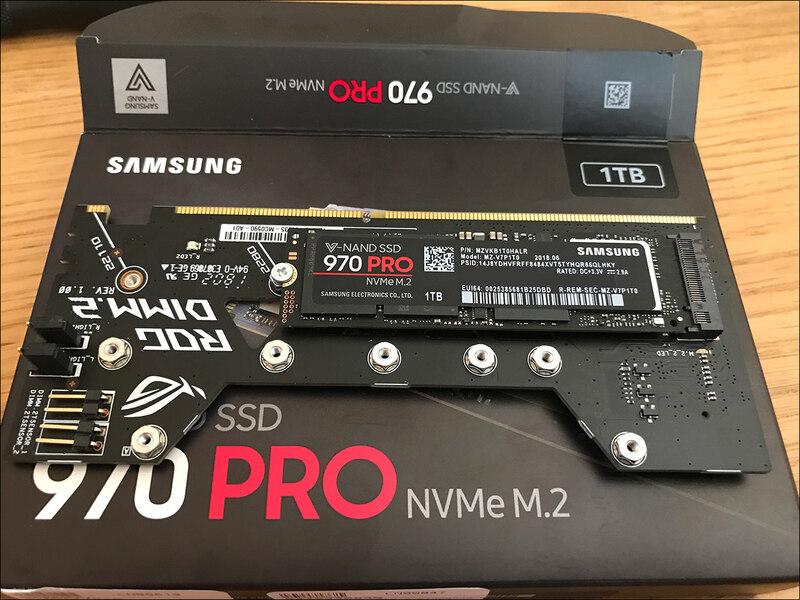 Discuss the Samsung 970 Pro 1TB M.2 on the OC3D Forums. I got one of these exact ones last week (1 Terabyte model). It's pretty great. Benchmarks I ran on it compared to the 850 Pro and some 840 Pro's in RAID0. It's certainly fast. It makes me excited for PCIe 4.0 and what they'll do with that. Possibly 7GB/s reads? 1 Million IOPs? (the 1TB 970 Pro is already at 500,000). Haven't even booted it up yet, still working on flushing the radiator and cleaning the loop...soon, soon! i have had my 970pro(s) since launch, and i am not complaining. they are epic.